He died at the Beatson Clinic where he was receiving chemotherapy treatment. 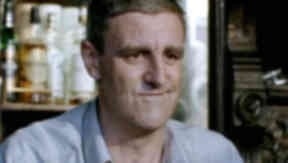 The actor Iain McColl, who shot to fame in the television sitcoms City Lights and Rab C Nesbitt, has died aged 59. His sister Martha told the Herald: "Just last week he put on a show for the patients and staff at the hospital and he was hilarious. He was doing impersonations of Chic Murray and Tommy Cooper and he had people in stitches. He couldn't not make people laugh." She added: "He wasn't in any pain. He never complained during the whole time he was ill. He went to sleep on Wednesday night and slept right through. He passed away last night at around 9pm." He appeared in the BBC Scotland sitcom City Lights between 1984 and 1991 and in the first run of the BBC Two series Rab C Nesbitt, which featured Gregor Fisher as the unemployed alcoholic title character. McColl returned for the programme's second run in 2008. He made guest appearances in Taggart, Still Game and Hamish Macbeth. In 2002, he had a small part in the Martin Scorsese movie Gangs of New York. McColl was separated from his wife and is survived by his three children.